Recently sitting next to me on a flight was a passenger with his therapy animal. No, it wasn’t a dog or a cat. I watched with curiosity as he took a hen out of the jiggling carrying case under his seat. Murmuring into its feathery neck, he cuddled it tenderly to his chest. The two appeared to relax one another, and when John introduced himself and Chicken Little, it was an easy leap to understand that John was a traveler fearful the sky would fall and CL was there to “allay” his fears. Before I tell the rest of the story, I ask your indulgence. I know there are already more bad chicken puns than we can tolerate. When I began writing, I thought it would be easy to sidestep the obvious poultry comments, but I fowled up – so feel free to groan as I struggle to tell an intriguing story while hoping the corny (see, it just happens) humor doesn’t bias you against chicken therapy. John is a Brit and assures me that therapy hens are commonplace in London. He met Chicken Little’s mom, while visiting his own grandmother in her nursing home. He saw a huge change in his grandmother’s vitality and energy as she became a caregiver to her hen, Sophie. He showed photos of his grandmother grooming Sophie’s feathers with a blow drier after she and Sophie showered together. 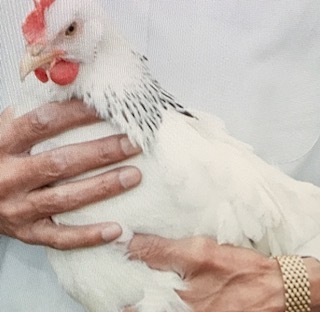 Apparently Henpower is a project that brings therapy hens – whole coups of them – to people in care settings like nursing homes and psychotherapy centers. The idea didn’t lay an egg, but caught on quickly. Hensioners have spread their henthusiasm by taking hen road shows to schools, community events and other care settings. John asked his grandmother to raise a chick that would become his. She took on the project with zest and eggthusiasm. She knew that when therapy hens are young they need a lot of handling so they get used to it. It motivated her to go outside, to stretch and bend, to lift and laugh, and to love. Day by day she and Chicken Little thrived. Chicks that grow up receiving love from humans, form special interspecies bonds. Before CL came into his life, John remembers how introverted he was. Each time John visited his grandmother, he bonded more deeply with CL until one day he felt confident that he was ready to take her home. He said there’s a stereotype that chickens are just livestock and they’ll run away and not interact. He assured me it isn’t true. Chickens react the same way as dogs react to a human that shows them love. John describes himself as autistic and says Chicken Little has done wonders for him. His personal experience confirms studies showing that therapy hens reduce depression, loneliness, and the need for anti-psychotic medication. He jokes that having an occasional egg to eat is a side benefit. It’s understandable that animal companionship, learning a new subject, caring about something outside of your own troubles, becoming part of a group that shares interests, and doing something unusual that gets people to inquire about your skill set rather than your deficits is henpowering. In the plane ride, John’s connection to CL was obvious as he babied her and fed her fresh vegetable scraps from his meal. He described her temperament and how she recognizes when he feels anxious. He insists that Chicken Little has a way of making him relax and feel more confident. As we approached our destination, CL disappeared into her carrying case and John’s conversation disappeared with her. Any skepticism I had about the effectiveness of therapy animals also vanished. I was eggcited to meet Chicken Little for John’s sake, but when I next consider getting a pet, I still prefer something furry to something feathery!